Manufacturing, Trading, Importer and Exporter of Casting And Sheet Metal Parts. 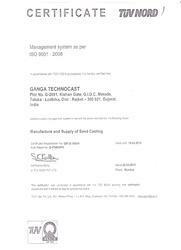 Founded in the year 1987, Ganga Technocast is the industry leading Manufacturer, Exporter and Trader firm exhibiting strong dedication in development of premium grade Casting and Sheet Metal Parts. The quality oriented ethos allows pioneering growth to enter our organization in form of a wide gamut of best in class products, such as Aluminium Bobbins, Cast Iron Casting, and Iron Casting Parts. Our products are outcome of a sustainable culture which equips us to bring forth user friendly product designs and beneficial attributions of robustness, precision engineered fabrications, excellent strength, rust resistance, fine finish, easy to fit and highly durable service life. The commitment and zeal of our people associates our success of the forefront of the industry, where we strive to garner the long unmet needs of our prestigious clientele. Our well laid and capacious infrastructure equips our R&D specialists and skilled market analysts to explore a number of innovative ideas and strategies of quality improvement. Further, our knowledge resources and technologically advanced factory base bring forth the opportunities of capacity enhancements and cost reduction of our manufacturing function, which indeed helped us to foster the growth we have made so far by delivering quality products at competitive price bands. The valuable guidance of Mr. Vishal Patel makes us able to optimize the business intelligence. His visionary perspective underpins our vision to create a firm base for tomorrow’s growth. We strive for product designs that exhibit our business intelligence, and we take pride that our team of highly innovative and passionate professionals eases the task. Our people are highly experienced and foster a collegial work environment where individual ideas are values and supported. Our team comprises of skillful personnel searching for the best options in form of research, manufacturing, stocking, quality compliance and sales and marketing. We sustain a result driven business approach that not only improves our product designs, but also firms our leading poise. We believe in being the business entity that is admired for its integrity, quality commitments and operational excellence, therefore, we have invested heavily in optimizing the knowledge and technological resources. Our combined organizational objectives strengthen the worth of our products that consolidate cost efficiency and timely awareness. The scope of our leading product designs and streamlined distribution network encapsulate our well laid work set up, which comprises of a modernized infrastructure designed and developed strategically to create close proximity with the patrons. A stern planning and resourcing resulted in a fully equipped work set up, where our factory divisions are parted into highly functional units for manufacturing, inventories, quality control, packaging and distribution. Quality control, or QC for short, is a process by which entities review the quality of all factors involved in production. ISO 9001:2008 defines quality control as "A part of quality management focused on fulfilling quality requirements". 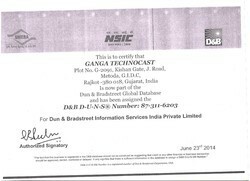 Our company registered with D&B. 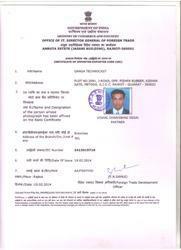 Our company is registered with Joint Director general of Foreign Trade.